She's previously credited beau Josh Hartnett with being behind her enviable wardrobe. But now that Tamsin Egerton is pregnant, the actress has evidently been rewriting the rule book with another chic addition on Tuesday afternoon - and it included a black coat dress over jeans. 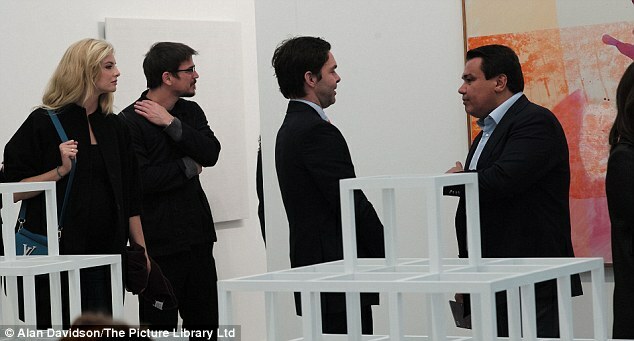 And the 26-year-old took a cultural trip to Regent's Park's Frieze Art Fair 2015 in London along with her handsome man, for what appeared to be quite the cultured day trip. The expectant mum drew attention to her super-slender legs with skinny jeans peeping beneath her oversized top. She paired the look with black ankle boots and a bright blue YSL bag on her shoulder as she posed in front of the artbook. Previously, Tamsin said that her stylish beau helps her to decide what to wear for most social occasions. 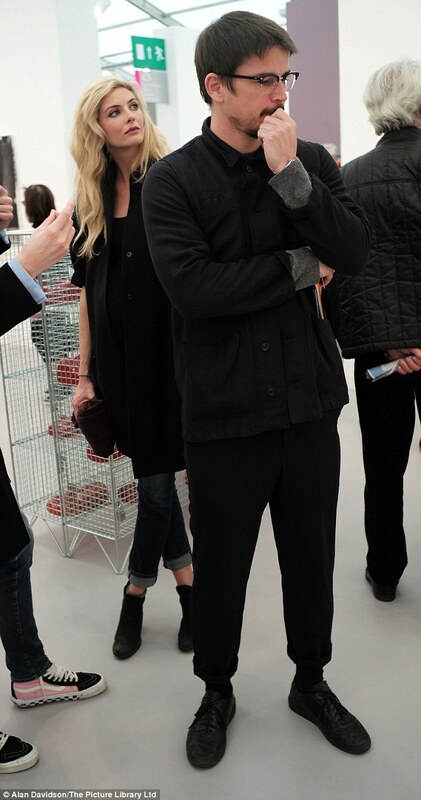 Josh, 37, meanwhile looked ever the learned chap in a smart all-black outfit that wouldn't have looked out of place at any metropolitan art gallery event. And it appears he had chosen to match his lovely lady's look with his trousers rolled up to reveal his ankles. The handsome Penny Dreadful star was rocking a debonair moustache and specs, giving him a certain intriguing air to go along with his genuine interest in the artwork. 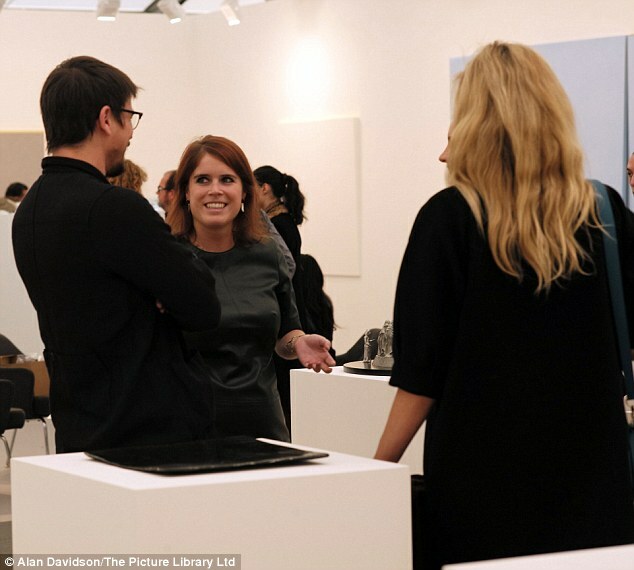 The couple looked in great spirits as they meandered around the exhibit, also bumping into Princess Eugenie and stopping for a chat. And they had made an impact on members of the royal family earlier this year when, at Wimbledon in July, they had enjoyed a conversation with the Duke and Duchess of Cambridge up in the stands. Tamsin and Josh, who have been together since 2012, are now happily counting down the days till they welcome their first child. And the beautiful expectant mum was the epitome of 'pregnancy glow' on Monday evening as she attended the VIP unveiling of three new sculptures at Embassy Gardens by EcoWorld Ballymore in London. The actress was a delight to behold in a loose-fitting short white shirt dress, that just about revealed her growing, changing form. The statuesque beauty's long, lithe pins were the main event, though, thanks to the thigh-skimming length of the smart and slightly sheer crisp dress. And, adding even more height to her willowy frame - Tamsin stands at over 5ft 8inches - she wore a pair of refreshing orange and red pointed heels, complementing her warm tan wonderfully. Her long blonde locks were curled into a gorgeous style, thrown over her shoulder, and the actress pulled her night-out aesthetic together with a slick of red lipstick and a little black clutch bag. Once inside the party, the St Trinians actress - who attended without her A-list man by her side - proudly showed off her lovely bump to a fellow guest, as she hugged the dress tightly to her frame, cradling her tum. Josh and the model-turned-actress started dating shortly after he was in a romance with American actress Amanda Seyfried. The Penny Dreadful actor has a number of famous exes including Scarlett Johansson, Mischa Barton and even Rihanna. Just a few months before the news broke, 37-year-old Josh revealed he was looking forward to being a father.